Northern’s new MA in Christian Ministries and Master of Divinity degrees are now available to students across the country via interactive live-streaming (Northern Live)! Apply to join a pilot group beginning Fall 2019. The Master of Arts in Christian Ministries (MACM) is a practical ministry degree designed to provide excellent training for those called to various fields of Christian service. The core classes are delivered to students across the country via our state-of-the-art, interactive live-streaming technology called Northern Live. With Northern’s smart classroom technology, you can interact with the professor and other students no matter where you live, earning a seminary degree without leaving your church and community. Northern believes the best way to learn ministry leadership is in a ministry context. In the new MACM program, students study and practice the skills of effective ministry leadership under the supervision of a faculty mentor and a pastoral mentor. Utilizing the best of competency-based education, students’ competencies in ministry will be demonstrated in context. The program allows each student’s learning journey to be personalized to address the particular needs of the student and their ministry context. For the ministry portion of the MACM, students must have a ministry internship placement. Northern can support you in identifying a church and pastoral mentor. The MACM can be fully distance, except for a one-time on-campus intensive experience on our main campus, followed by live-streaming courses throughout the academic year. The MACM program requires 54 quarter hours (the equivalent of 36 semester hours). Northern’s MACM is customizable for different churches and ministry contexts. Click here to learn more about how Northern can come alongside your church to train your emerging leaders. The program includes 10 courses + 8 ministry learning modules spread over three quarters per year and (for students with a specialization) an annual intensive course. 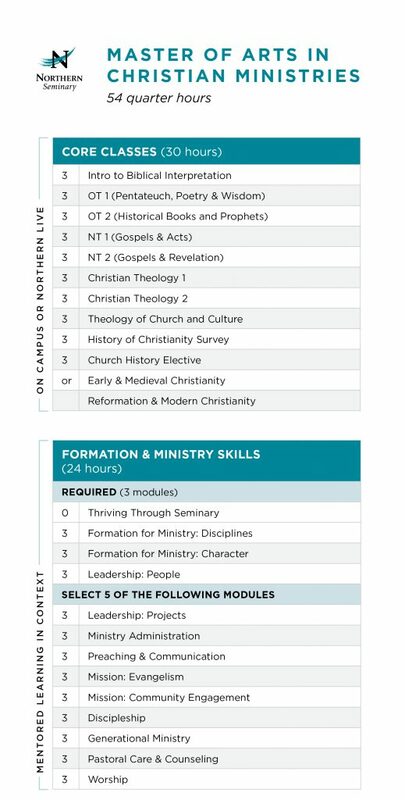 Northern Seminary will admit a small pilot group of students in its new MACM program for Fall 2019. Apply now to save your place or contact admissions@seminary.edu for more information. Students may apply for Northern scholarships awarded by need and merit.